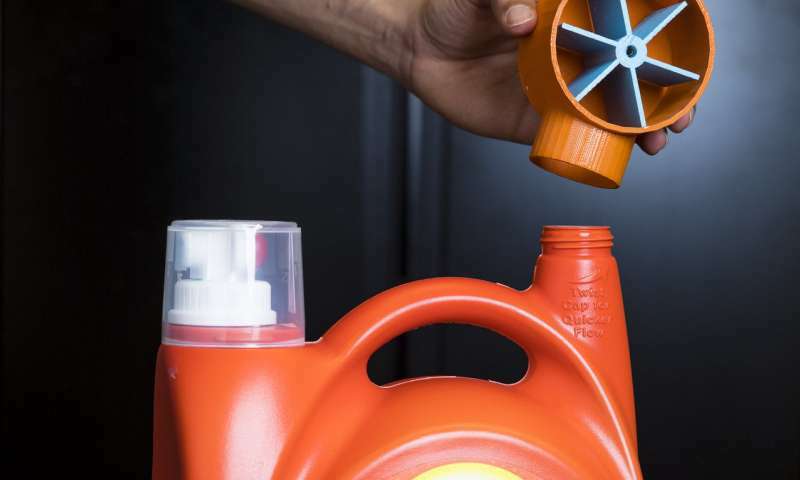 Imagine a bottle of laundry detergent that can sense when you're running low on soap—and automatically connect to the internet to place an order for more. "Our goal was to create something that just comes out of your 3-D printer at home and can send useful information to other devices," said co-lead author and UW electrical engineering doctoral student Vikram Iyer. "But the big challenge is how do you communicate wirelessly with WiFi using only plastic? That's something that no one has been able to do before." The system is described in a paper presented Nov. 30 at the Association for Computing Machinery's SIGGRAPH Conference and Exhibition on Computer Graphics and Interactive Techniques in Asia. 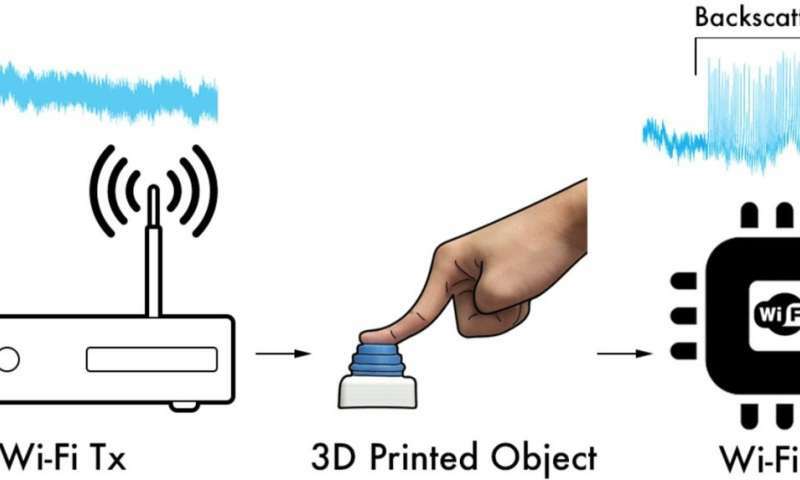 To 3-D print objects that can communicate with commercial WiFi receivers, the team employed backscatter techniques that allow devices to exchange information. In this case, the team replaced some functions normally performed by electrical components with mechanical motion activated by springs, gears, switches and other parts that can be 3-D printed—borrowing from principles that allow battery-free watches to keep time. 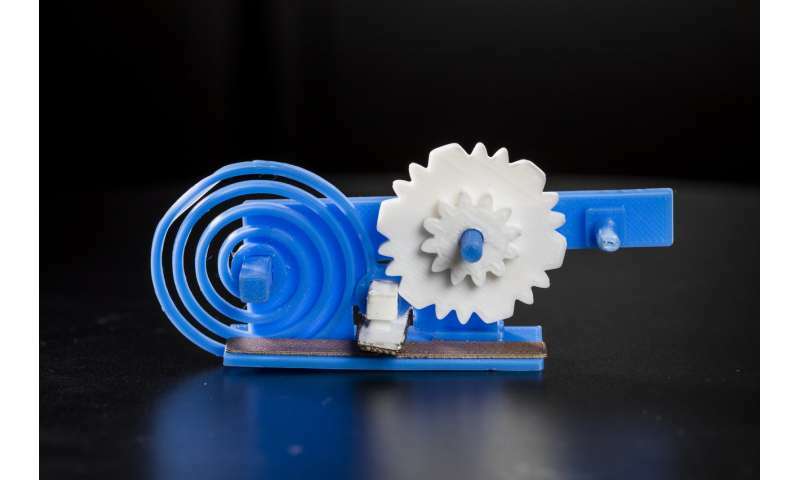 Physical motion—pushing a button, laundry soap flowing out of a bottle, turning a knob, removing a hammer from a weighted tool bench—triggers gears and springs elsewhere in the 3-D printed object that cause a conductive switch to intermittently connect or disconnect with the antenna and change its reflective state. Information—in the form of 1s and 0s—is encoded by the presence or absence of the tooth on a gear. Energy from a coiled spring drives the gear system, and the width and pattern of gear teeth control how long the backscatter switch makes contact with the antenna, creating patterns of reflected signals that can be decoded by a WiFi receiver. "As you pour detergent out of a Tide bottle, for instance, the speed at which the gears are turning tells you how much soap is flowing out. The interaction between the 3-D printed switch and antenna wirelessly transmits that data," said senior author and Allen School associate professor Shyam Gollakota. "Then the receiver can track how much detergent you have left and when it dips below a certain amount, it can automatically send a message to your Amazon app to order more." They also 3-D printed WiFi input widgets such as buttons, knobs and sliders that can be customized to communicate with other smart devices in the home and enable a rich ecosystem of "talking objects" that can seamlessly sense and interact with their surroundings. 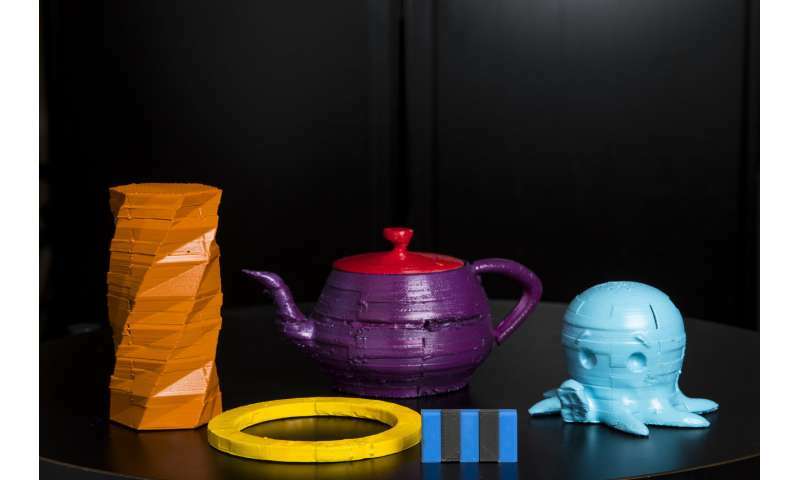 Using a different type of 3-D printing filament that combines plastic with iron, the team also leveraged magnetic properties to invisibly encode static information in 3-D printed objects—which could range from barcode identification for inventory purposes or information about the object that tells a robot how to interact with it. "It looks like a regular 3-D printed object but there's invisible information inside that can be read with your smartphone," said Allen School doctoral student and co-lead author Justin Chan. "...without electronics"?? Antennas and switches are electronic devices. Still very clever. But not really a new idea - look up US Embassy bugging by the Soviets with "Infinity Transmitter". I wonder how small these things can be made. I am thinking about making a biosuit that tracks joint motions in my garage. If I can create a unique sensor pattern for every joint, and make the thing small enough, I can make all the sensors right in my home shop with only the expense of the plastic itself. Great so since it's not programmable I spam my neighbors' WiFi routers with unrouted IoT messages, not to mention my own!!!??!? Pretty darn cool. I agree with Da Schneib though. You could spoof a signal from the IOT to your receiver. A powerful RF spoofed signal acting as a switch (as the video shows) could open all kinds of doors. However, in the right application it might be a perfect solution. What you want to be sure of is that it's not a quick-n-dirty solution. If you can make each transponder have a unique address then you can have a router for them that you program to only listen for yours. But again, security. Now your neighbor can make money from a manufacturer who gets them to aggregate data from all the houses around them. Further applications left to the observer. Remember that likely producers of such objects will most likely be the manufacturer of the supply that is being consumed, who will have an interest in your data. If this doesn't make you uncomfortable you haven't thought your way through it yet. I don't think it would be that useful. First you'd have to listen in on what your neighbor is 'sending'. Then you have to play that back...but since the signal has no identifier you don't really know what you'd be sending. You could potentially prank someone - but you wouldn't know what you're pranking them with. Try to imagine, that this bottle will leak in your bathroom and it will wipe-out your bank account in similar way, like the mobile phone with unlimited credit on roaming. You will return from holiday and find pile of Amazon packages before your home (all delivered automatically with drones indeed). That would be impossible. Read the article, it explains how the sensor works. It cannot sense how much the bottle contains, it estimates how much you pour out, if the bottle leaks it will just run dry before the sensor realizes it and you will be stuck without softener. I have to give them Kudos for ingenuity but I cannot fathom how it would work in real life. Most people are lucky to have Wi-Fi coverage in their entire home with one router. That is with active devices pumping out milliwatts of power. Also, how does a piece of plastic acquire the IP address needed to be accepted by a network when most home routers assign IP addresses on a temporary basis. Just Saying. In order to transmit a Wi-Fi packet with a unique address there need to be some active logic circuitry involved. This device is just modulating the RF of the existing packets and a receiver is reading the modulated RF. It would be pretty hard to give each unit a unique identity. The fact is that they could do the same thing with any RF transmitter and receiver. They are just amplitude modulating a RF carrier by changing how much signal is reflected to the receiver. Anywho, I hope the get an A on their term paper. It is only a matter of years before everyone will be required to have a chip embedded in their body. The government will create mass riots and confusion. People will willingly stand in line for the procedure for "public safety" reasons. After all "Its for the safety of the children! ".